We recommend using public transport to arrive. Find the details for your arrival at www.wienerlinien.at/silvester, www.oebb.at or via the WienMobil app. Should you need to come by car, please note that the city centre may already be largely closed for vehicles starting in the morning and parking restrictions will be in force. 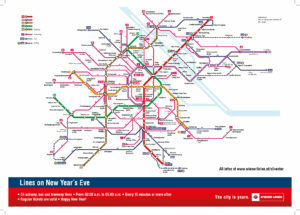 Here you will find a list of all Wiener Linien public transport services that will be running in the night of New Year’s Eve. You will find a wide range of accommodation options on the Vienna Tourist Board website, which you can book directly at wien.info/en/hotels. We summarized the answers to your frequently asked questions. Can I bring pyrotechnic products to the New Year’s Eve Trail and use them? No, the carrying and setting off of fireworks, firecrackers or any other pyrotechnic articles is prohibited for safety reasons. The only exception to this is sparklers, which may be ignited while keeping an appropriate distance to people and objects. However, those who cannot do without pyrotechnics may enjoy the fireworks on Rathausplatz at midnight. How do I get to the New Year’s Eve Trail? We advise all visitors to travel to and from the New Year’s Eve Trail with public transport. All U-Bahns as well as several bus and tram lines will be running services all night long. 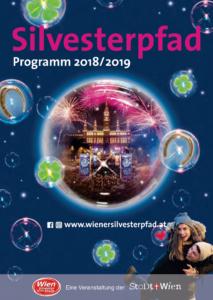 You can find a list of them in the printed programme folder or at www.wienerlinien.at. In order to better organise your arrival and departure, please use the route planner by Wiener Linien or their app WienMobil. Where can I buy tickets for the New Year’s Eve Trail? The New Year’s Eve Trail is a public event. There is no need to purchase any kind of ticket. Is there an entrance fee for the New Year’s Eve Trail? No, admission to the New Year’s Eve Trail is free. This makes the Vienna New Year’s Eve Trail one of Europe’s biggest public New Year’s Eve celebrations. When will the New Year’s Eve Trail take place? The New Year’s Eve Trail starts on 31 December 2018 at 2.00 pm and ends on 1 January 2019 at 2.00 am. On New Year’s Day at 11.00 am, the New Year’s Concert by the Vienna Philharmonic Orchestra will be transmitted live from the Wiener Musikverein to the Rathausplatz and Herbert-von-Karajan-Platz. You can find out more about this under the menu itemProgramme. Please note the following site regulations for your visit. Among other things, this includes a list of prohibited objects. Protecting the environment is important to us. This includes the sorting of waste. We kindly ask you to dispose of your waste properly. In order to avoid excess waste, returnable mugs and deposit containers have been in use for several years on the New Year’s Eve Trail. The deposit for mugs and champagne glasses is 4,-€ and 3,-€, respectively.